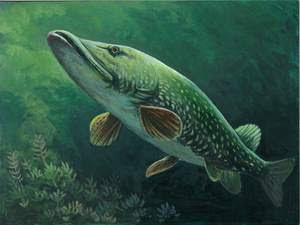 White Bear Lake, MN – Wildlife Forever and title sponsor Bass Pro Shops are proud to announce the winners of the 20th Anniversary State-Fish Art Contest. A distinguished panel of five honorary judges selected the following Top 12 National Awards from the 1st place winners of all 50 states plus international. 2018 judges included Jeff Edmundson, KARE11; Doug Grann, Wildlife Forever board; Ed Rudberg, CD3; Bob White, wildlife artist and Erin Williams, National Park Service. “Students, educators and parents from across the United States and around the world connect with this contest, with its amazing student’s art and aquatic conservation message,” remarks Bob Ziehmer, Senior Director of Conservation at Bass Pro Shops. The grades 10-12 top honor went to Na Eun Kim from the Republic of Korea with, “Trout’s Recovering Memories”, his stunning watercolor of a brook trout. Second Place was awarded to Ian Oh of California. Yejin (Shelly) Lee Li from Virginia received Third Place. Mindy Zheng from Herndon, Virginia took First Place in grades 7-9 with a captivating acrylic, titled “Northern Pike”, swimming out of the deep. The Second Place winner was Nicole Li of Georgia and Third Place went to Yuzhe Tian from Massachusetts. The 4-6 grade category winner is Alston Leung from Great Neck, New York with his watercolor of a kid on a dock fishing for bluegill titled “Bluegill”. Second Place went to Calvin Yu from Massachusetts and Third Place to Bethany Zhao of California. 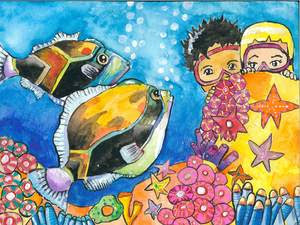 Top honors in the “Mighty Minnows” K-3 grades division went to Ivy Mou from New York with her delightful watercolor painting, “Hawaii Triggerfish”. Second Place was awarded to Aadya Ganjalagunte from Arizona and Third Place to Zia Lee from Washington. The Smile Award is given to a painting selected from all the contest entries that “makes you feel good inside when you see it. 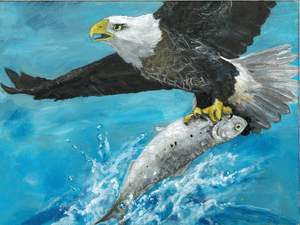 You just can’t help but smile!” said Karen Hollingsworth, Manager of State-Fish Art. Vritika Gupta. 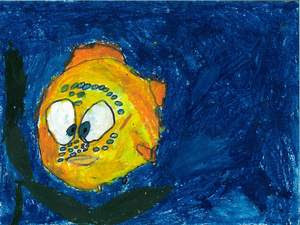 a talented kindergartener from Princeton Junction, New Jersey, is the winner with, “Sad Fish”, a delightful smile-worthy oil pastel. The artist winning this year’s Invader Crusader was selected from all the entries in the Silent Invader Category. 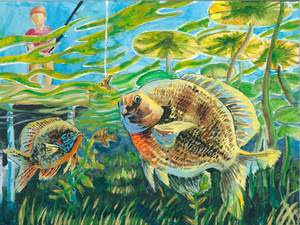 The artist needs to paint not only a state-fish species, but also an invasive species. The 2018 winner is Mark Acker, a 9th grader from Harpers Ferry, West Virginia, with his watercolor and colored pencil art “The Underwater Fish”. It shows a native humuhumunukunukuapoa’a swimming in water infested with the invasive aquatic plant Hydrilla. Invasive species are capable of causing extinctions of native plants and animals, reducing biodiversity, competing with native organisms for limited resources, and altering habitats. National 2018 “FISH MAKE YOU SMARTER AWARDS” are announced on www.statefishart.org for the best essay that is required in addition to the art. 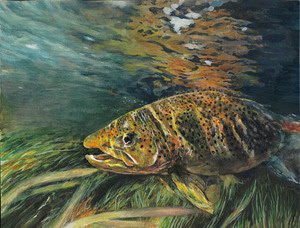 All state winners in the four grade categories from across America and internationally are listed at www.statefishart.org. 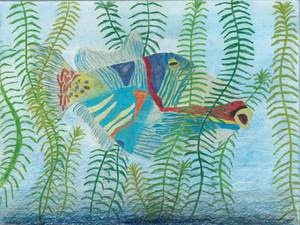 The Wildlife Forever State-Fish Art Contest seeks to involve students in the outdoors through the arts. Students compete in four grade-level divisions: K-3, 4-6, 7-9 and 10-12. Deadline for submitting entries to the contest is always March 31 each year.